If you ever played cowboys and Indians, or watched a western movie thinking “I wish I could be there” here’s your chance. 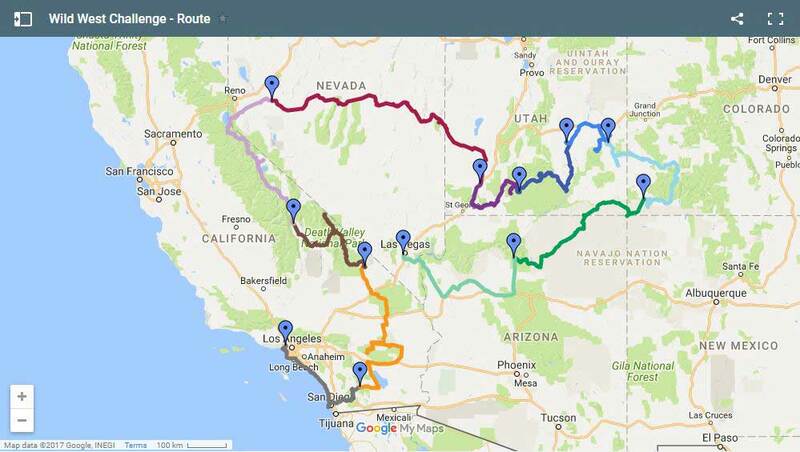 Join us and take the Wild West Challenge, an epic journey winding across the Old West of America. Be part of the first Wild West Challenge! It is the inaugural event of this minimal assistance rally, conducted in a similar fashion to those Travel Scientists events already popular around the world. We provide you with the plan, organization and safety, but you can choose how much additional assistance or services you need. Tents or hotels, it’s your call, we’ll research all the options for you. Wild West Challenge is a genuine adventure though, an accomplishment that nobody can take away from you: In a place where men are still men, where a cowboy hat is not a laughing stock but a necessity. 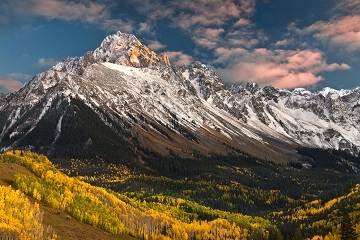 But it’s so much more than the atmosphere of the Wild West frontiers, gold miners and the Pony Express. The Wild West Challenge rally takes you across the most justly world famous natural landmarks you can find in such a small area anywhere in the world. So choose your trusty steed, with four or two wheels, saddle up and set out to this epic journey with the Travel Scientists. Thousands of miles and five states in less than two weeks: Make the Pony Express boys proud! Some claim the true West doesn’t exist anymore – we invite you on this epic journey to prove you that it very much does. Wild West Challenge takes you from Hollywood, Los Angeles to Las Vegas, two iconic cities of American culture and arguably the two most fun cities of the country. In between you get a feel of an interesting mixture of Small Town USA and the frontier spirit, so you’ll see a lot of the true America and we at the Travel Scientist will make sure, that you don’t miss out on any of the highlights! Waste some money in style in the casinos of Las Vegas. Stroll along Sunset Boulevard together with Hollywood’s stars and wannabes. Get all hot and sweaty in Death Valley. 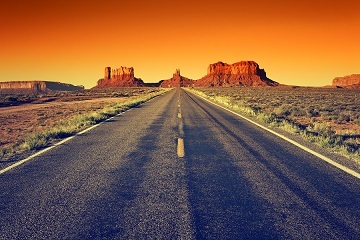 Drive the “loneliest road in America”, lined by old ghost towns. Meet the goblins of Goblin Valley. 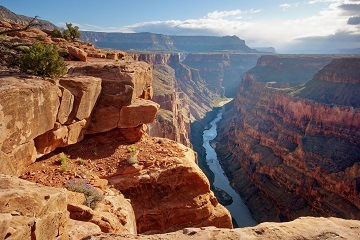 Get blown away by the sheer size of Grand Canyon. See the world through the giant rock arches of Arches National Park. Feel like John Wayne in Monument Valley. Spend some nights under the starlit desert sky. 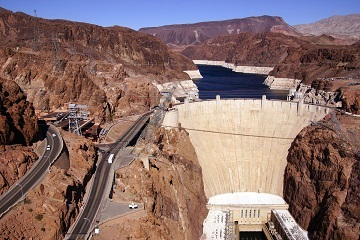 Drive across world famous Hoover Dam. Drive by the yucca palms, which give Joshua Tree National Park its name. 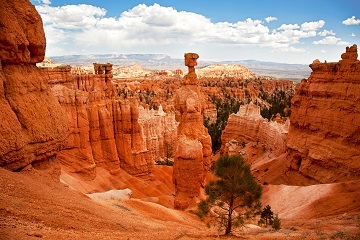 Count all the shades of red, orange and white in Bryce Canyon. Follow the winding Burr Trail and explore Utah’s true back country. Ride among the towering sandstone chimneys of Kodachrome Basin. Gaze upon the steep cliffs of Zion Canyon. Cross Navajo Nation, the largest Native American territory in the USA. Explore ancient North American history in Mesa Verde National Park. The Wild West Challenge sets out from the glamorous Hollywood. We squeeze ourselves out of the endless city of angels due Southeast, and say goodbye to urbanization! The night finds us in the Sonoran Desert, where the World Biosphere Reserve expects us with prime camping facilities. 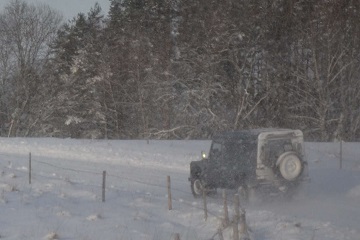 By the end of the day it’ll all make sense why we take this trip in April. 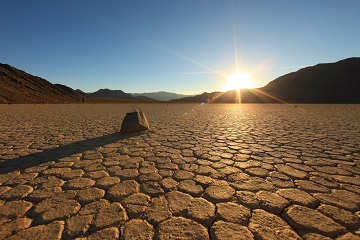 We put the challenge in Wild West Challenge: Fill your canteens in the morning, because the day takes us through the Death Valley, the hottest place recorded on Earth! We head into the largest NP in mainland US, seeing intimidating sights like the Devil’s Golf Course, the Panamint Mountains and the Lone Pine. Seeing the small Independence, CA will be close to the most relieved you’ll ever feel in your life. We pass Manzanar, a monument of the sad internment of Japanese citizens during WW2. 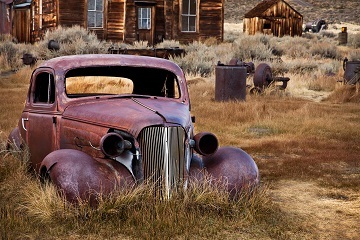 The mining ghost town of Bodie will provide you with excellent photo opportunities! We enter Nevada and the state capital Carson City, which also boasts some memories of frontier life and silver mining. We spend the night in Fallon, famous for its naval airbase, home of the Top Gun training program. Talking about Highway to the Danger Zone! For the most of the day we follow the old Lincoln Highway, the oldest transcontinental road from 1912, dubbed “the Main Street of America”. This part however is also called the “loneliest road in America”, with mostly ghost towns by the roadside for unending miles. 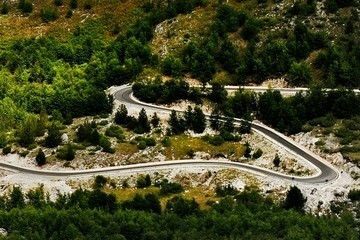 Mountain passes and sharp turns, this might be the most scenic drive you’ll ever take. We take a day off in Cedar City for a well-earned rest. Having arrived in Utah we can try the famous Mormon hospitality. You can spend the day watching Roadrunner cartoons or look out the window, the landscape is the same. 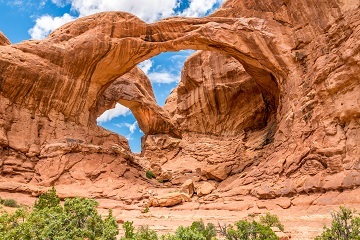 Have you seen pictures of natural rock arches over the roads? This is that place. Then Zion Canyon gives you the opposite experience of the Grand Canyon: Here you are driving in the bottom with steep walls enveloping you. The colorful “hoodoos” of Bryce Canyon will also be familiar from some epic Windows screensaver. We continue driving across the breathtaking landscape of Utah, passing Capitol Reef National Park, the famous Burr Trail and Glen Canyon. 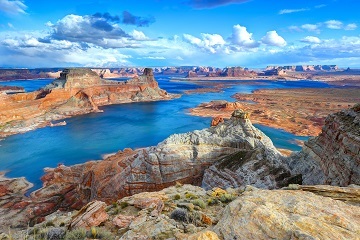 The red rocks and deepest blue water of the artificial Lake Powell might be the most amazing clash of colors you’ll see, putting Instagram filters to shame. Utah still has more amazing landscape to show. The Delicate Arch and the Arches National Park is another thing you must have seen on National Geographic but never thought you would see with your own eyes. Try to reach the Island in the Sky before sunset, because that’s a sight you won’t want to miss. Before leaving Utah we get to see the amazing Looking Glass Arch. Colorado welcomes us with the legendary Durango, a real frontier town, no wonder Chevy named a rugged truck after it. We drive along the “Million Dollar Highway”, which is said to have a fortune in gold dust paved in its concrete. The end of the day finds us by the Mesa Verde National Park, one of the greatest archaeological sites in the world. We pass the Four Corners, the unique spot where four state lines run together; if you want to jump into New Mexico for a few minutes here’s your chance! 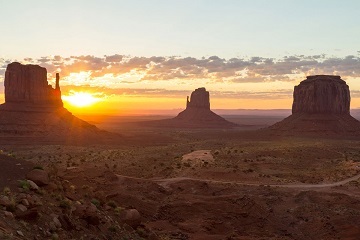 But it’s worth continuing into Arizona: Monument Valley is probably the most recognized scenery anyone could pick from a western movie. Within a real Navajo Indian Reservation, too! But we finish the day at probably the most famous landmark of the Americas: the Grand Canyon. 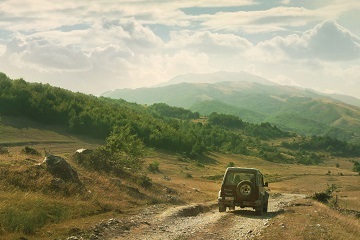 After all these amazing scenes and rugged adventures you are probably eager for some civilization. But not rest, right? Hope you kept a clean change of clothes, because we finish our great Wild West Challenge in the City of Sin today. Put on your lab coat and your shoelace tie, and join the longest ongoing experiment of partying that is Las Vegas!